Middlesbrough head coach Aitor Karanka has blamed himself for the club's second loss in four days. Boro, who had won their previous four matches, have tumbled from eighth to 13th following setbacks against and the Royals. 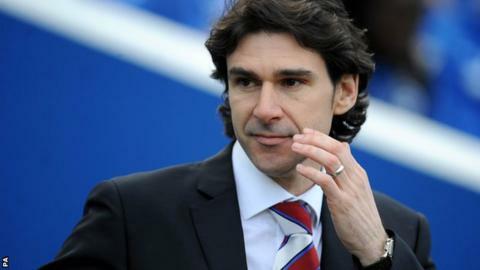 Karanka told BBC Tees: "It's my fault. I wasn't able to motivate my players. "Against Millwall and the same today we saw two teams who wanted to win and one team that didn't." He added: "I am learning every day about the league and the players, everything." The Spaniard replaced former Boro player Tony Mowbray as manager in November, and the club were 18th place after his opening game in charge ended in defeat by Leeds. However Karanka, who has brought in players such as Kenneth Omeruo and Nathaniel Chalobah on loan from Chelsea on the basis of his friendship with Jose Mourinho, lifted Boro well clear of danger. The Teessiders have two Championship matches left to play, with Barnsley visiting the Riverside side on Saturday before the final match of the season away to Yeovil.